Home Modern 3BHK is an absolute delight to stay and relax in the midst of nature and lush greenery. 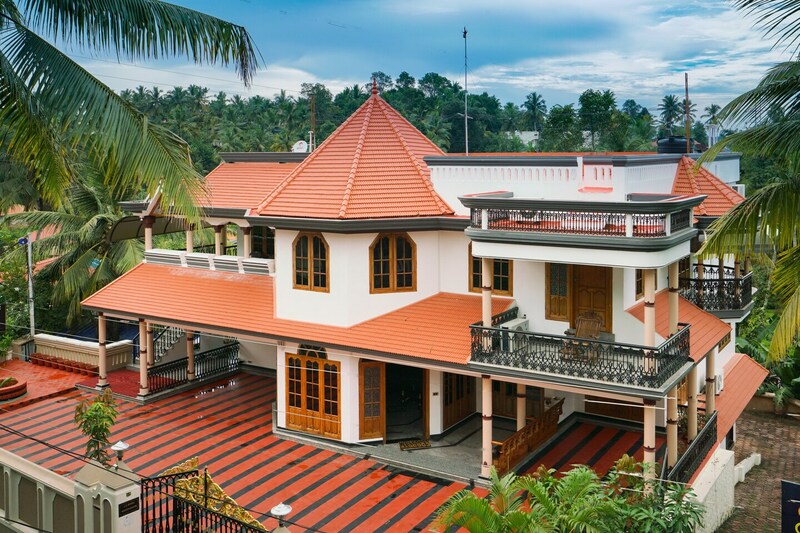 With the red tiled roof and white walls with wooden frame windows and doors are stunningly beautiful. The interiors of this villa are elegantly decorated with wooden furnishing, comfortable sofa and lounge chairs, wood enamelled Greek styled pillar, wall arts, and various human and animal statues are quite charming. The kitchen is spacious with wooden storage spaces and modern amenities provided such as electric kettle, toaster and fridge. The bedrooms are bright and spacious with minimal furnishing and huge French windows which make the room comfortable, inviting and pleasant. Enjoy the surroundings with your morning cuppa while sitting in the balcony. This place is pet-friendly too.